This lighthouse stands out for its distinctive red exterior. This design was intentional, to set the Currituck Lighthouse apart from its Outer Banks neighbors. After completion, the lighthouse was left unpainted, allowing visitors to marvel at the sheer number of bricks involved in its construction. For centuries, hundreds of ships were lost in the treacherous waters off of the Outer Banks. In the Northern Outer Banks, ships travelling close to shore to avoid the swift and tumultuous Gulf Stream could easily get shipwrecked against the shoreline, as the miles of Currituck's barrier island was relatively uninhabited, with nothing but dark coastline to confuse and disorient the passing sailors. In response, construction began on the Currituck Beach Lighthouse in 1872, and three years later on December 1, 1875, the lighthouse first glowed as a beacon to passing ships. Adjacent to the lighthouse, a Victorian style lighthouse keepers' home was built in 1876, providing housing for the principal keeper's family and two assistants' families. The lighthouse was electrified in 1933, and the keeper's positions were discontinued in 1937. Over the next four decades, the lighthouse keepers' home began to fall into disrepair. In 1980, the non-profit organization Outer Banks Conservationists, Inc., as well as the state of North Carolina, took notice to the deteriorating home, and began a complete restoration of the original keepers' home and the overall Currituck Beach Lighthouse grounds. 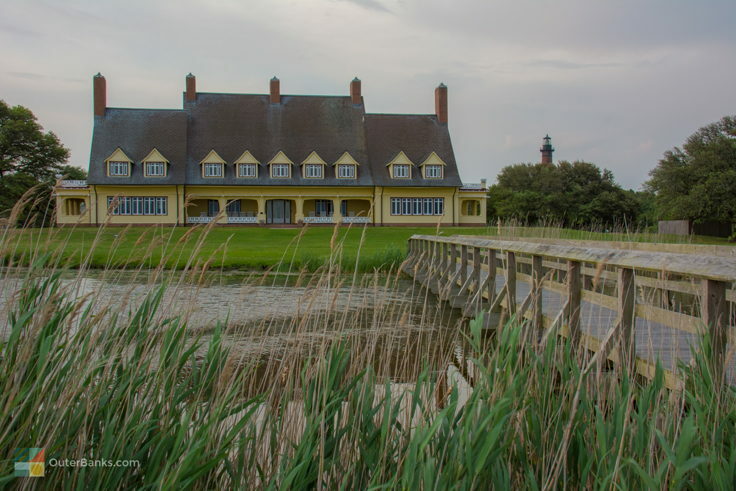 With such intricate work involved, the restoration of the home itself continues even today, but other buildings, including a small 1920 white dwelling intended for a third lighthouse keeper, are completely remodeled and serve as gift shops, storage areas, and information centers. The Currituck Beach Lighthouse grounds are open for exploration all year long (with occasional short interruptions). Visitors can stop by at any time of the year to explore and get an up-close view of the famous brick lighthouse and outlaying buildings. The grounds close occasionally for staff vacations and repair work. 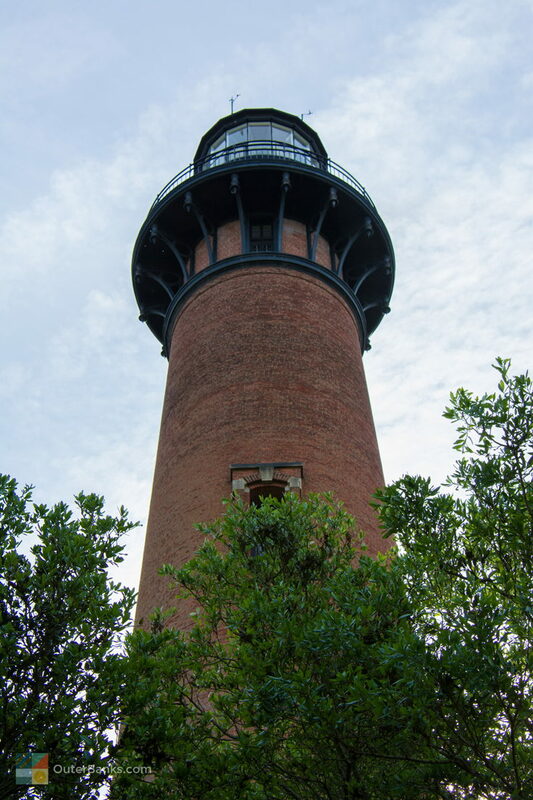 Seasonally, the lighthouse itself is open to visitors, who can climb the 220 steps to the top for unparalleled views of the Whalehead in Historic Corolla, the Currituck Sound, and the Atlantic Ocean. 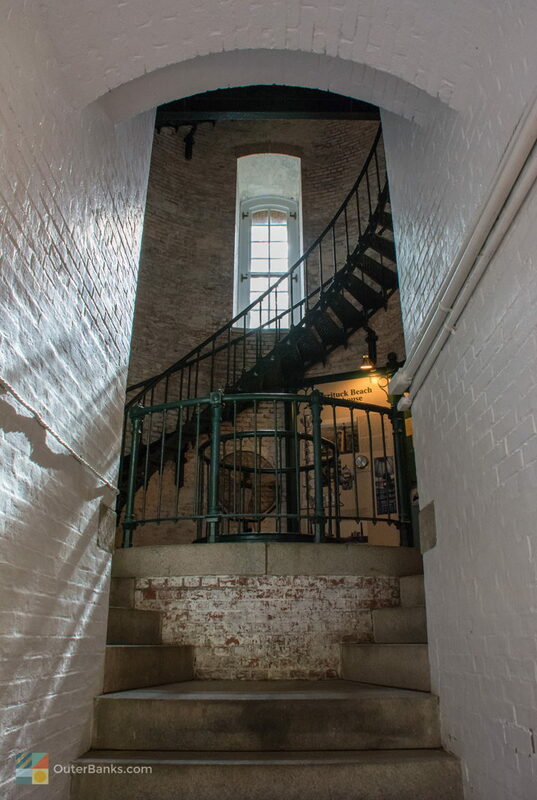 If you make the climb, be sure and pause at both the base of the lighthouse and the first two landings for museum quality exhibits showcasing the history of the lighthouse, the lighthouse keepers, and the giant Fresnel Lens, still in operation. The Currituck Beach Lighthouse is open daily for climbing from 9:00 a.m. to 5:00 p.m. from Easter until the day before Thanksgiving. Tickets are inexpensive for adults and children under 7 can climb for free as long as they are accompanied by an adult. In addition, a Museum Gift Shop is also open seasonally, and features Outer Banks books, lighthouse memorabilia, clothing, and other treasures. The lighthouse and lighthouse grounds can also be booked for weddings, school field trips, and other special events. Visit the lighthouse's website for additional information on special occasions and large groups. Where is the Currituck Beach Lighthouse? The Currituck Beach Lighthouse is located in the heart of Corolla in the northern Outer Banks, and is stationed along Corolla Village Road. When was the Currituck Beach Lighthouse built? Construction on the Currituck Beach Lighthouse first began in 1872, and the structure was completed and first lit on December 1, 1875. How many steps are in the Currituck Beach Lighthouse? 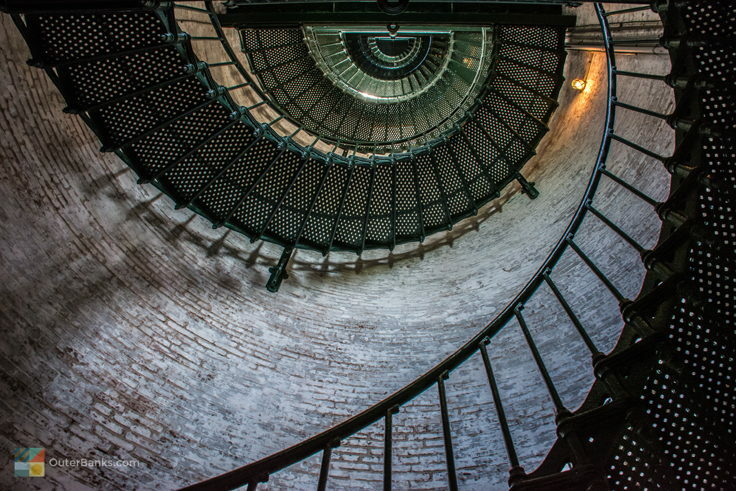 The Currituck Beach Lighthouse has a total of 220 steps from the base of the lighthouse to the lens at the top. How do you get to the Currituck Beach Lighthouse? Outer Banks visitors will want to head north on N.C. Highway 12 to the northernmost OBX town of Corolla, where the Currituck Beach Lighthouse is located. 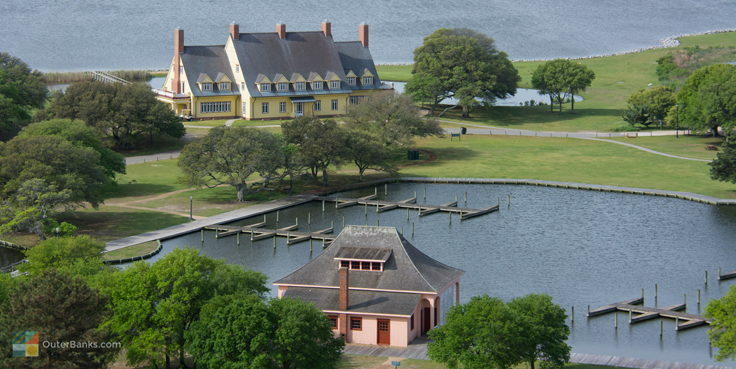 The lighthouse is next to the Historic Corolla Park, and is situated along Corolla Village Road. Can you climb the Currituck Beach Lighthouse? The Currituck Beach Lighthouse is seasonally open to folks who want to climb to the top, generally from early spring until late November. When can you climb the Currituck Beach Lighthouse? The lighthouse is open for climbers during daylight hours from early spring until Thanksgiving weekend. The Currituck Beach Lighthouse may close when there are severe thunderstorms or high winds in the forecast. Can you climb the Currituck Beach Lighthouse at night? The Currituck Beach Lighthouse is not open at night. Typically, in the shoulder season months, it is open for climbers until 5 p.m., and is open until roughly 8 p.m. from Memorial Day until Labor Day. Can you climb the Currituck Beach Lighthouse if it’s raining? Visitors can still climb the Currituck Beach Lighthouse if it’s raining, however the lighthouse may temporarily close for thunderstorms, high winds, or other severe weather events, like hurricanes. Does it cost money to climb the Currituck Beach Lighthouse? There is a small fee to climb the Currituck Beach Lighthouse, however children ages 7 and under can climb for free, provided they are accompanied by an adult. Why is the Currituck Beach Lighthouse important? The Currituck Beach Lighthouse is the northernmost lighthouse on the Outer Banks and the state of North Carolina. It’s also the only coastal North Carolina lighthouse to have an unpainted brick exterior, which makes it stand out among the other black and white colored lighthouses along the Outer Banks. Who owns the Currituck Beach Lighthouse? The Currituck Beach Lighthouse is owned by the Outer Banks Conservationists (OBC), which is an organization that performed the majority of the renovation and refurbishing work required to open to the structure to the public in the 1980s. Where can you stay near the Currituck Beach Lighthouse? Because the Currituck Beach Lighthouse is located in the heart of Corolla, visitors will find that there are a number of accommodation options available in the area surrounding the lighthouse. Options include vacation rental homes and condos, hotels, motels, and resorts. Do I need reservations to climb the Currituck Beach Lighthouse? Reservations are not required to climb the Currituck Beach Lighthouse, and tickets can be purchased on-site. Is the Currituck Beach Lighthouse lit? The Currituck Beach Lighthouse is lit with a First Order Fresnel lens that was installed in 1939. Visitors staying in Corolla can often see the light rotation on a nightly basis. How often is the light rotation at the Currituck Beach Lighthouse? The light at the top of the Currituck Beach Lighthouse “flashes” for three seconds every 20 seconds. How far away can you see the Currituck Beach Lighthouse light? On a clear night, the light of the Currituck Beach Lighthouse can be seen from up to 18 nautical miles away. What kind of light does the Currituck Beach Lighthouse have? 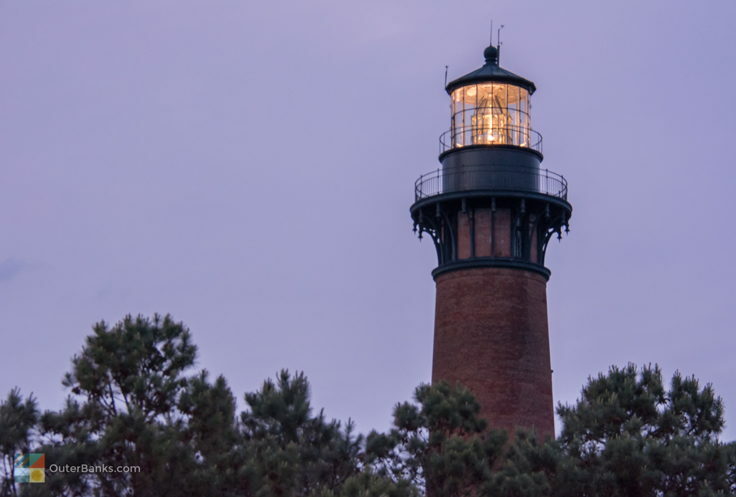 The Currituck Beach Lighthouse has a First Order Fresnel lens which was installed and first lit in 1939, and which is the largest size available for all American lighthouses. Is there a Currituck Beach Lighthouse museum? 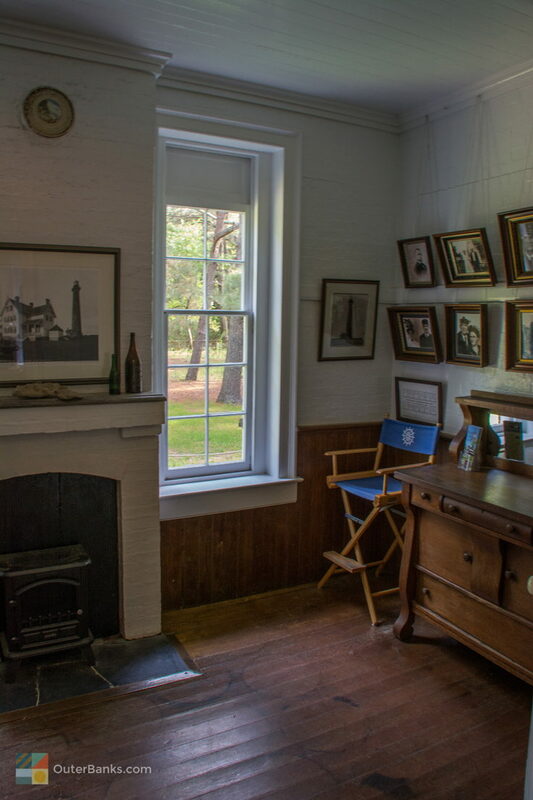 The original Keeper’s Quarters for the Currituck Beach Lighthouse has been transformed into a small museum which has artifacts, photos, and other memorabilia from the lighthouse’s nearly 150 years of service. Where can you eat near the Currituck Beach Lighthouse? 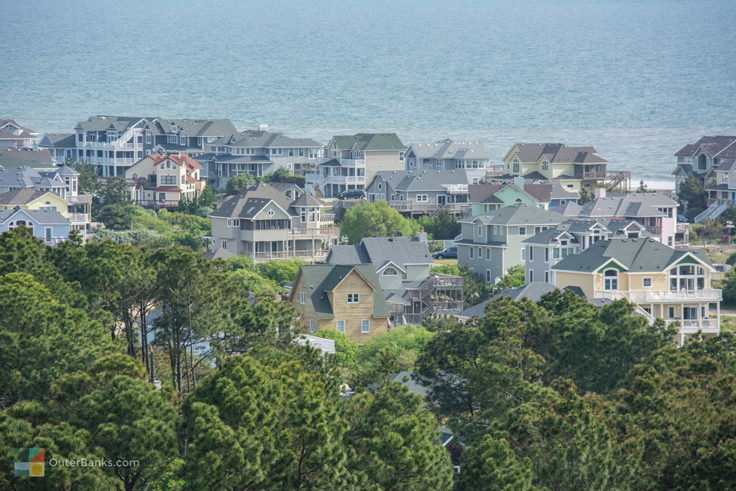 Visitors will find that there are dozens of dining options in Corolla, which includes fine dining eateries, casual lunch spots, fast food chains, delis and markets, and everything in between. Does the Currituck Beach Lighthouse have a gift shop? The Currituck Beach Lighthouse does have a Museum Shop which is stocked with T-shirts, hats, postcards, books, taffy, holiday ornaments, jewelry, and all-things lighthouse related. Are there any restrooms at the Currituck Beach Lighthouse? There are restrooms available to the public at the Currituck Beach Lighthouse. What are the attractions near the Currituck Beach Lighthouse? 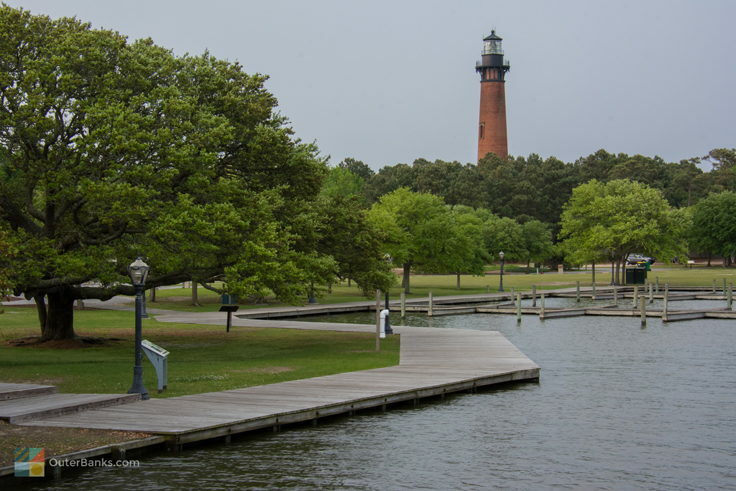 The Currituck Beach Lighthouse is adjacent to a number of top Corolla attractions, which includes the Outer Banks Center for Wildlife Education, the historic Whalehead Club, and Historic Corolla Park. Visitors will find that they can walk from one attraction to another with relative ease when they visit the Currituck Beach Lighthouse.